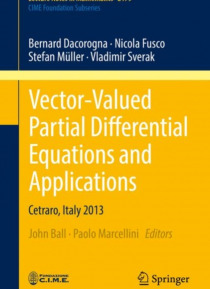 Collating different aspects of Vector-valued Partial Differential Equations and Applications, this volume is based on the 2013 CIME Course with the same name which took place at Cetraro, Italy, under the scientific direction of John Ball and Paolo Marcellini. It contains the following contributions: The pullback equation (Bernard Dacorogna), The stability of the isoperimetric inequality (Nicola Fu… sco), Mathematical problems in thin elastic sheets: scaling limits, packing, crumpling and singularities (Stefan Muller), and Aspects of PDEs related to fluid flows (Vladimir Sverak). These lectures are addressed to graduate students and researchers in the field.